Whee! It's so awesome when they do these things! :D ...Not so awesome thet my 20-month-old goes into the fridge by himself to get food though. oh who is the big boy? 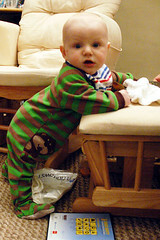 And my Owen has the same jammies! Oh what a great picture!! !He is getting so big!! I love the green and brown stripes. Alex has a 2 piece pj set that says "Sleep Stinks" with a skunk on the front. I just wish I could get him to keep wearing the footie pjs. Oh, well done young sir! Good boy! I am reminded of a lion, rampant facing forward (forgot the heraldic for that last part). Looks like he is ready to jot down a few ideas.